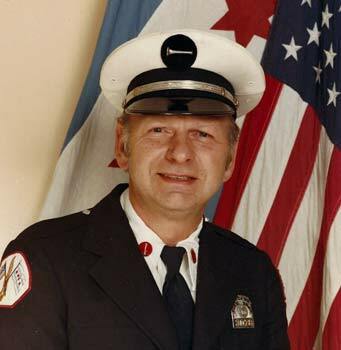 Lt. Thaddeus “Ted” Lewandowski, 87, of Chicago, CFD retired. Veteran US Army. Died September 26, 2018. Beloved husband for 64 years to Joyce Leora Lewandowski, nee Green. Adored father of Lynn (John) McGeown, Todd (Myra), Dean (Christine), Devin (Tricia) Lewandowski and Karen Koperek. Cherished grandfather of Christina (Joe), John (Karah), Catherine (Chuck), Nick, Karianne, Zachary, Lucas, Hannah, Jaxon, Anton, Devin Jr., Robert, Nina and Lillian. Loving great grandpa of six. President of the Chicago Firemen’s Association Credit Union. Proud 62 year member of Local 2. Past Commander and longtime administrator of the Educational Fund of the American Legion Chicago Firemen’s Post 667. Visitation Friday, September 28, 2018 from 3 until 9 PM at the M. J. Suerth Funeral Home, 6754 N. Northwest Highway, Chicago. In State Saturday, September 29, 2018 10:30 AM at St. Paul Lutheran Church, 5201 Galitz Street, Skokie, IL 60077. Funeral Service 11:00 AM. In lieu of flowers, memorials appreciated to: E.M.W.Q., Firemen’s Widow and Orphans Fund, 20 S.Clark St., Suite 1400, Chicago, IL. 60603 appreciated. Interment Acacia Park Cemetery. For further information 877-631-1240 or www.suerth.com.